This final design for our card making class allowed us to get all of our pent-up scallops out (I CASE'd this; thank you for the inspiration, LeeAnn Graff!). I actually made this for my sister first, then thought the class members would enjoy it, too. 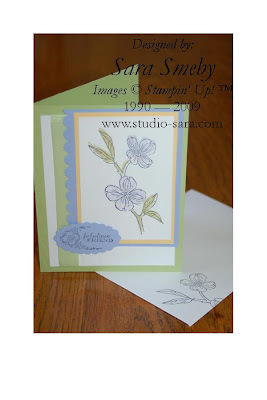 This pretty Soft Summer flower stamp is available until June 30 (it's from the Occasions Mini Catalog). Finally, when using the Scallop Edge Punch to do an entire side as I have here, punch first in the middle and then work your way out. Whenever I start at the tippy-top or bottom, I end up with a scalloped diagonal because I get off-course. Keeping one "bump" that you've already punched out in your "sites" as you punch helps keep you straight. Happy Birthday, Mobes! I love you! oi td bem com vc? parabens pelo seu blog.